Little Nipper gets an earful at It's a Wind Up! 78 DJs stall at Salford Museum and Art Gallery. It's a Wind Up! 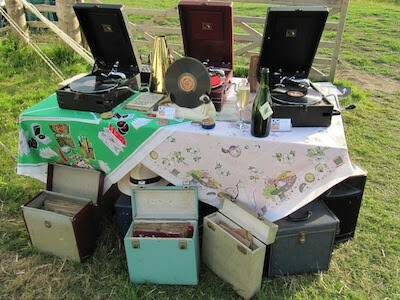 Vintage 78 DJs set-up en plein air (that's outside, if you're not quite as pretentious as I am). Photo courtesy of It's a Wind Up! Vintage 78 DJs. Annabel of It's a Wind Up! Vintage 78 DJs enjoys the country air. Photo courtesy of It's a Wind Up! Vintage 78 DJs. 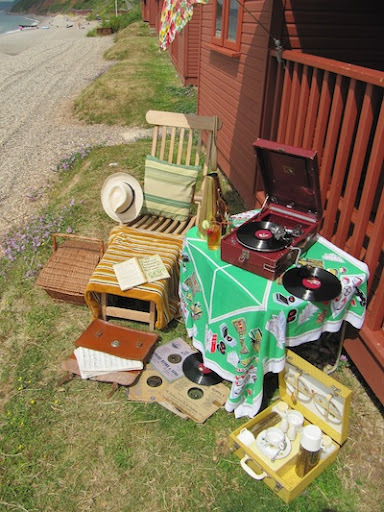 Isn't this your fantasy of a vintage seaside picnic with authentic musical accompaniment? Well it certainly is mine! Photo courtesy of It's a Wind Up! Vintage 78 DJs. We first welcomed It's a Wind Up! Vintage 78 DJs to our pop-up fair at Salford Museum and they made a huge impact. Fortunately, it appears that they enjoyed themselves nearly as much as we enjoyed them so they may be joining us again. 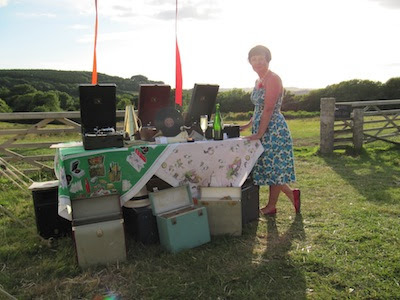 Offering a truly vintage experience in every sense of the word, Matt and Annabel of It's a Wind Up! Vintage 78 DJs present the finest selection of old shellac 78rpm discs from the 1920s to the 1950s for your listening pleasure; from the New Orleans hot jazz of Louis Armstrong through to the big band sounds of Glen Miller and Duke Ellington and on to those disreputable greasy rock'n'rollers such as Elvis and Little Richard! 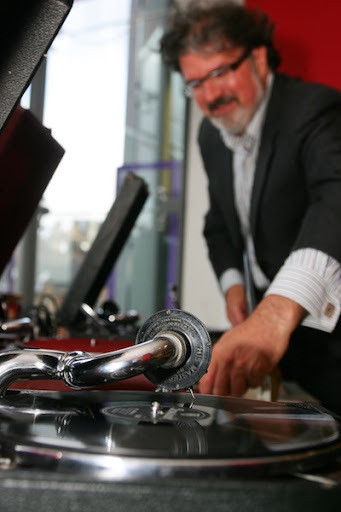 We pride ourselves on getting the music right and lots of our old records are in near mint condition guaranteeing that the sound quality from our superbly maintained HMV 102 gramophone players is the highest “low-fi” you will hear! Not only that, but Matt and Annabel are true vintage aficionados and dress themselves, and their set, in full 1940s or 1950s kit depending on the demands of the occasion. They may even offer a few authentic treasures from their extensive collections for sale at the same time, if you're lucky. As a musician I wanted to experience the music as people would have heard it originally. I read an interview with Dizzy Gillespie and he said he’d worn out a record of Miles Davis' in a day! It had to be a 78 so I went out and got one. The experience is real and immediate and it’s become a mission to collect this stuff and get it out there somehow. My knowledge and understanding of the music has grown and every time we acquire discs we learn more. 78 DJ is just the best and most fun way to hear this music and it’s feels great when the audience digs and dances to the discs. If you want to find out more about It's a Wind Up! Vintage 78 DJs please visit their website. You can also find them on Facebook, Twitter and Myspace. Matt of It's a Wind Up! Vintage 78 DJs in action. Photo courtesy of It's a Wind Up! Vintage 78 DJs.